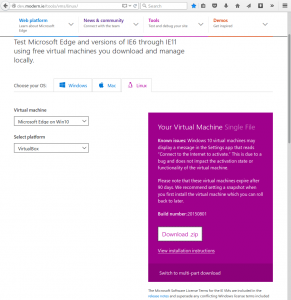 Microsoft has released Windows 10, and with it the possibility to Download a Windows 10 Appliance to run under Virtual Box, VMWare player, HyperV (for windows), Parallels (Mac). Their idea is to allow you to test Microsoft Edge new browser in addition of being able to test the older browsers in older VM images. I wanted to use Windows 10 to check compatibility with my messenger c-client. Also I wanted to know how Java behaves. The Windows 10 VM image will work for 90 days. 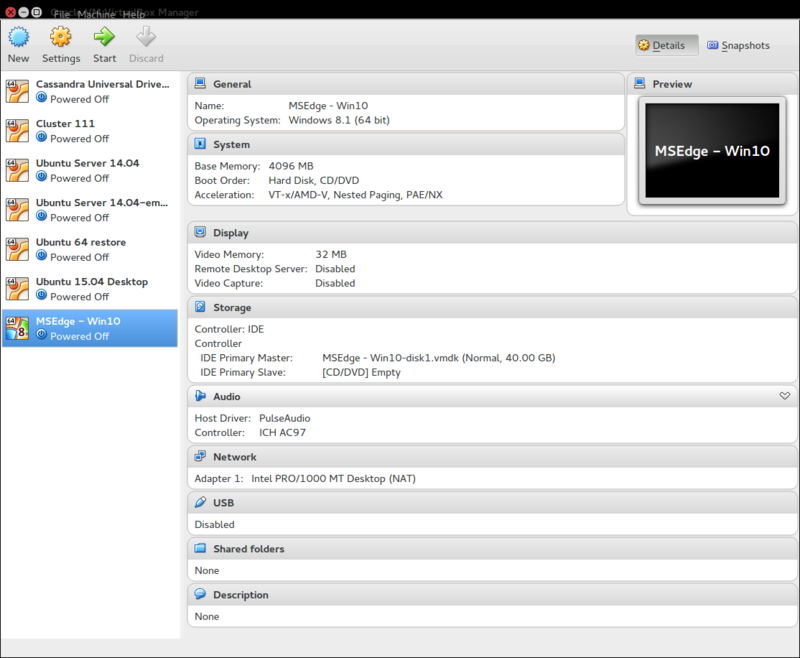 You can download it from here (http://dev.modern.ie/tools/vms/linux/). 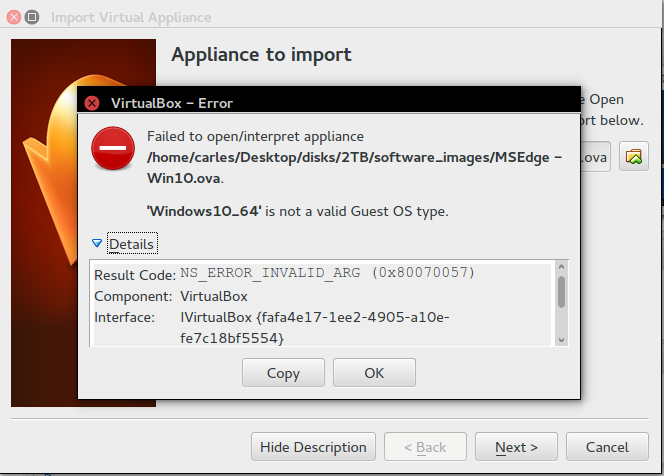 Instructions are very precarious and they didn’t specify a minimum version, however if you use Virtual Box under Ubuntu 14.04, so Virtual Box 4.3.10, you’ll not be able to import the Appliance as you’ll get an error. Update: Thanks to Razvan and Eric!, readers that reported that this also works for Mac OS 10.9.5. 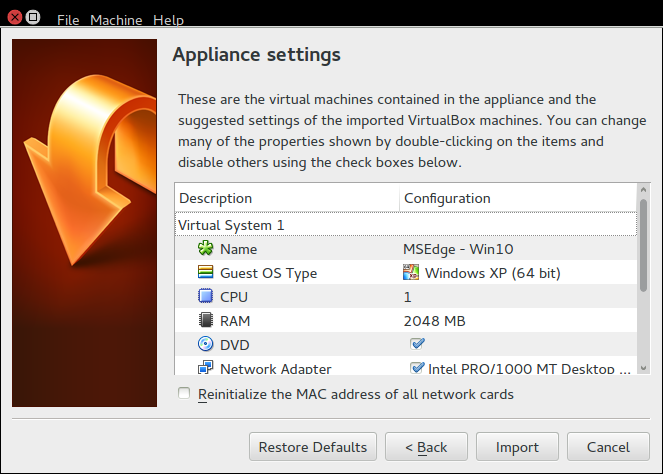 + Virtual Box 4.3.12 and VirtualBox 4.3.20 running under Windows 7 respectively. 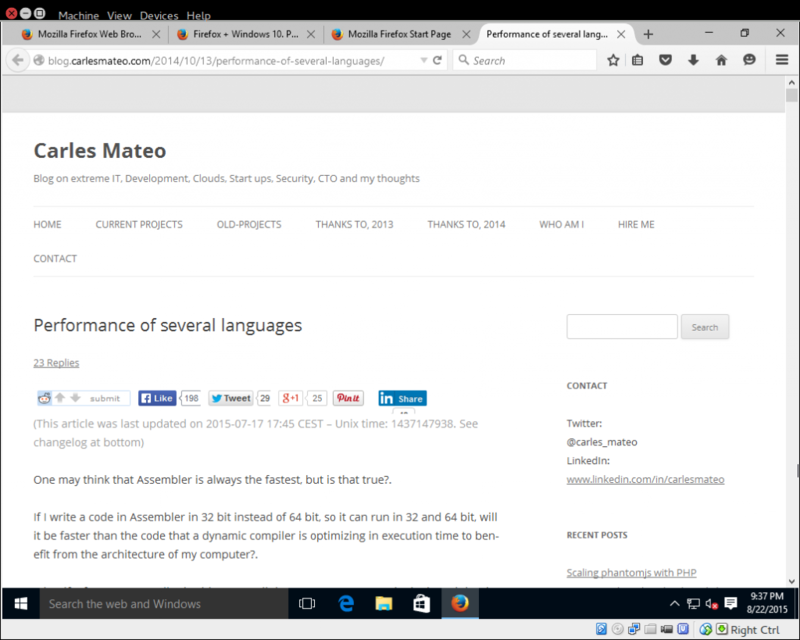 ‘Windows10_64’ is not a valid Guest OS type. I was looking to find a solution and found no solution on the Internet, so I decided to give a chance and try to fix it by myself. The error is: ‘Windows10_64’ is not a valid Guest OS type. so obviously, the Windows10_64 is not on the list of the VirtualBox yet, it is a pretty new release. Microsoft could had shipped it with OS Type Windows 64 Other, or Windows 8 64 bits, but they did’t. I wondered if I could edit the image to trick it to appear as a recognized image. 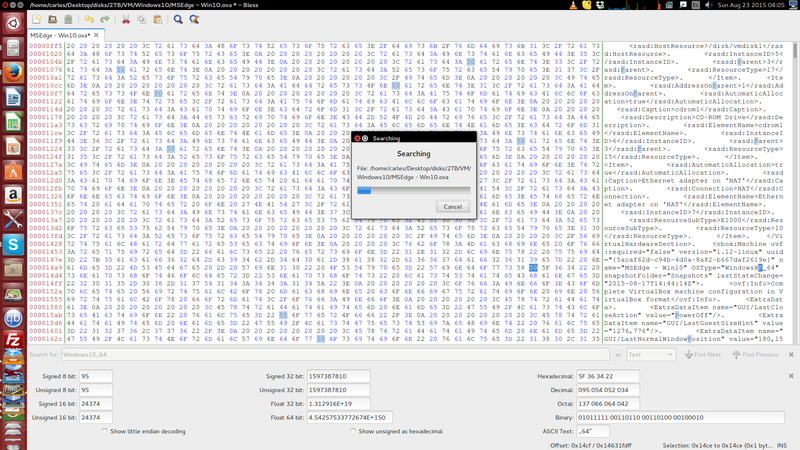 I edited the file (MSEdge – Win10.ova) with Bless Hex Editor, an hexadecimal editor. I looked for the String “Windows10_64” and found two occurrences. 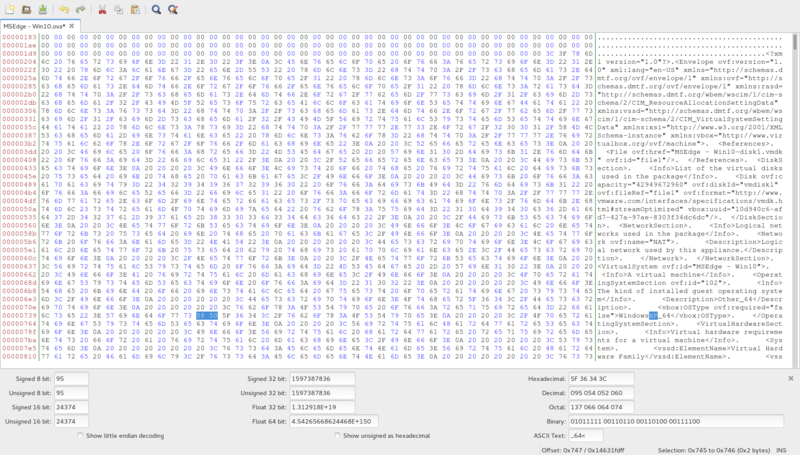 I had to replace the string and leave it with exact number of bytes it has, so the same length (do not insert additional bytes). I searched for the list of supported OSes and found that “WindowsXP_64” would be a perfect match. I replaced that 10 for XP twice. Then tried to import the Appliance and it worked. I tried to run it like that, but it froze on the boot, with the new blue logo of windows. I figured out that Windows XP would probably not be the best similar architecture, so I edited the config and I set Windows 8.1 (64 bit). I also increased the RAM to 4096 MB and set a 32 MB memory for the video card. Then I just started the VM and everything worked. This entry was posted in Casual tech, Troubleshoot, Virtualization, Web development and tagged Bless Hex Editor, Microsoft, Ubuntu 14.04, Virtual Box, Windows 10 on 2015-08-23 by Carles Mateo.